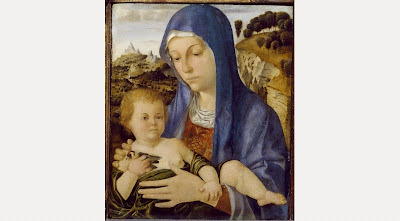 Every day for more than fifteen years, I have looked at a print of this painting. Now many more people have seen it, due to the publication in 2013 of The Goldfinch by Donna Tartt, a Pulitzer Prize winning novel. I have not yet read the book, but I recently had two other encounters with goldfinches which prompted me to look at this profound painting with fresh eyes. Last week during mizzling rain, I went outside to get some wood for the fire and was stopped in my tracks by a very persistent goldfinch, who flew back and forth in front of me until it was sure I had stopped moving. Once I was standing absolutely still, it landed a few feet from me and disembowelled a dandelion. Its beak was stuffed with fluff as it dug out the tasty seeds, alert but unconcerned by my proximity. 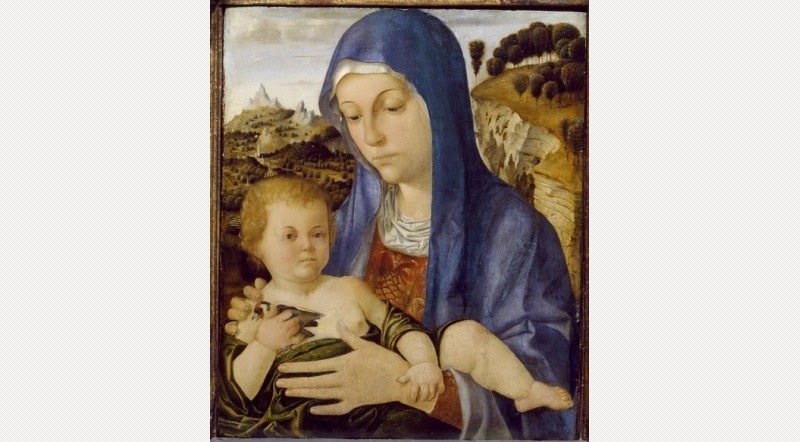 The second encounter was with this painting by Montagna in the Ashmolean Museum, Oxford. Because the goldfinch loves thistles and thorns, it is associated with the crown of thorns worn by Christ on his way to Calvary. The goldfinch was used as a symbol of the suffering Jesus endured before his crucifixion, and the red spot on the its face is said to be a drop of Christ’s blood. The poor goldfinch in this painting is caught in a time vortex, already marked with blood yet to be shed by the boy who is squeezing him hard and carelessly round the middle. 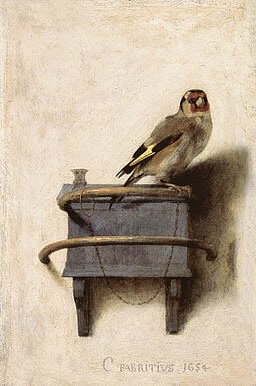 So the goldfinch bears this meaning, the pain endured by the innocent, and, in the painting by Fabritius, becomes that sufferer, the innocent prisoner condemned. with no chance of ascent. but the stare you return pleads nothing.